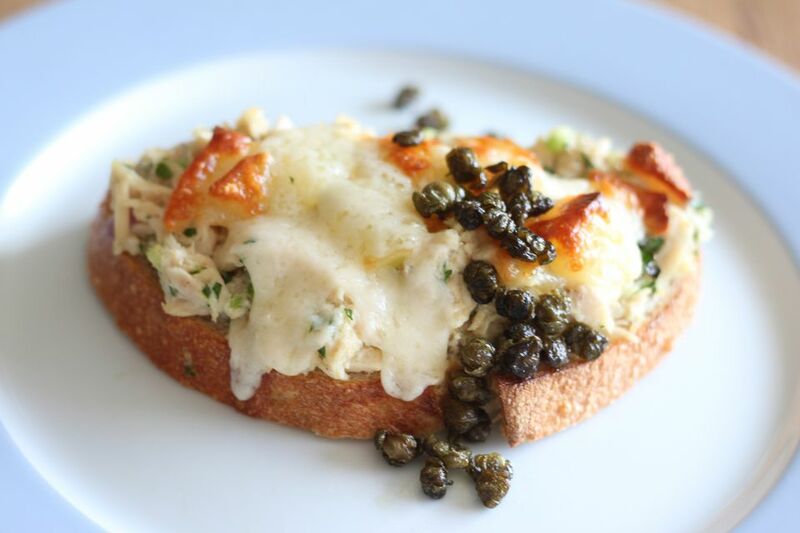 A little fine tuning and one secret ingredient - fried capers - sets this tuna melt apart from others. Make sure to keep the tuna melt under the broiler long enough for the cheese to get slightly browned and crispy on top. Crispy capers are simply capers quickly fried in olive oil. They have a slightly crispy texture and addictive salty flavor. Crispy capers are also delicious tossed into pasta and served over pork chops. Confused by all the different types of canned tuna at the market? Here's the lowdown. Canned tuna often comes from albacore, skipjack, bluefin and yellowfin tuna. Which flavor you like best is a matter of personal taste, but keep in mind that the flavor can vary since not every albacore tuna out there tastes the same. Tuna comes in solid, chunk and flaked varieties. Solid should have a larger piece of tuna in the can. Chunk tuna has pieces of tuna and flaked has a soft, shredded texture. Tuna is packed in water or oil. Oil-packed tuna tends to be more flavorful. Capers are the flower bud on a bush native to the Mediterranean. The buds are sun-dried then pickled in vinegar brine. Capers are usually quite small, but stemmed caperberries are as large as an olive. It is often recommended that capers are rinsed before eating because they are so salty. In a medium bowl, mix tuna with mayonnaise, 3 tablespoons extra-virgin olive oil, caper juice, red onion, celery, and parsley or dill. Add salt and pepper to taste. Set aside. Lay out 4 slices of bread. Drizzle with olive oil or spread with mayonnaise. Spread tuna evenly over each slice. Top each slice generously with cheese. Place under the broiler, keeping an eye on the bread and rotating as necessary, until the cheese is completely melted and browned slightly on top. Pull out of the oven and top with crispy capers before serving.